Pep Guardiola will quit as Bayern Munich manager and take over at Manchester City, according to an extraordinary report. The report emanates via Qatari-owned sports media giant Bein Sports, who claim that the former Barcelona manager has agreed to join City in time for the 2015-16 season. Former Sky football anchor Richard Keys, who now works extensively in the Middle East, claimed that the story is “true”. Meanwhile Bayern lost 1-0 at home to Ausburg as goalkeeper Pepe Reina was sent off. First-choice Manuel Neuer was rested with Tuesday’s Champions League semi-final against Barcelona in mind. Bayern wrapped up the league title two weeks ago, but have lost all four games since then – including a penalty shootout defeat by Borussia Dortmund in the German Cup semi-final. 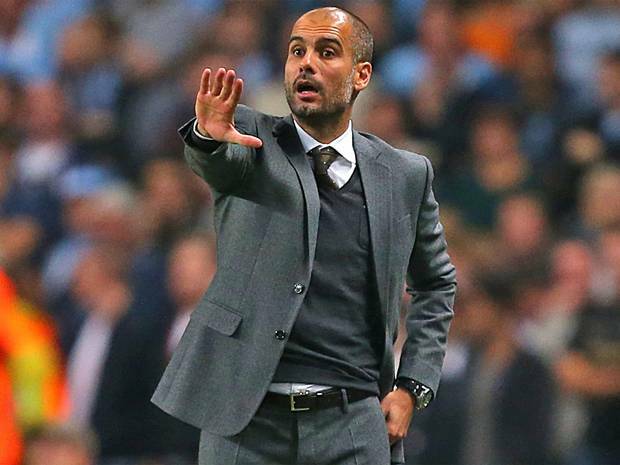 Addressing the media at his news conference in Munich on Friday, Guardiola defended his record. “There will always be pressure at a big club,” he said. “I accept that. I also want to win everything, but sometimes it’s not easy.